8 Ways - How to Learn Bulgarian for Beginners. Start Here. That means Hello in Bulgarian! So, you want to learn Bulgarian? Yes? Good. Keep reading. Let’s start with the simple stuff. You’ll learn the SOLID way to learn Bulgarian so you don’t fail. Then, you’ll start speaking Bulgarian with simple phrases. There’s even a FREE Audio & Video lesson at the bottom. If you find this lessonuseful, please email it to a friend! Let’s go. Is it Hard to Learn Bulgarian? You want to know what to learn with, right? But here’s a big problem. The internet is low on GOOD Bulgarian learning resources. So, not everything you’ll find will be useful. You’ll find silly “match a picture to a word” apps. Pointless “arrange these words into a sentence” quizzes that don’t teach you anything. You don’t even know how to make a Bulgarian sentence! A) BulgarianPod101. 100s of Audio & Video Lessons by Bulgarian Teachers. You need a complete Bulgarian learning program. BulgarianPod101 is the best one to date. This is an online course for self learners. Inside, you get Audio & Video courses. You get new lessons every week so they’re always growing. With them, you can go from beginner to advanced and learn to read, speak, write and understand Bulgarian. Very beginner friendly and highly recommended. You can use their app too to learn on the go. 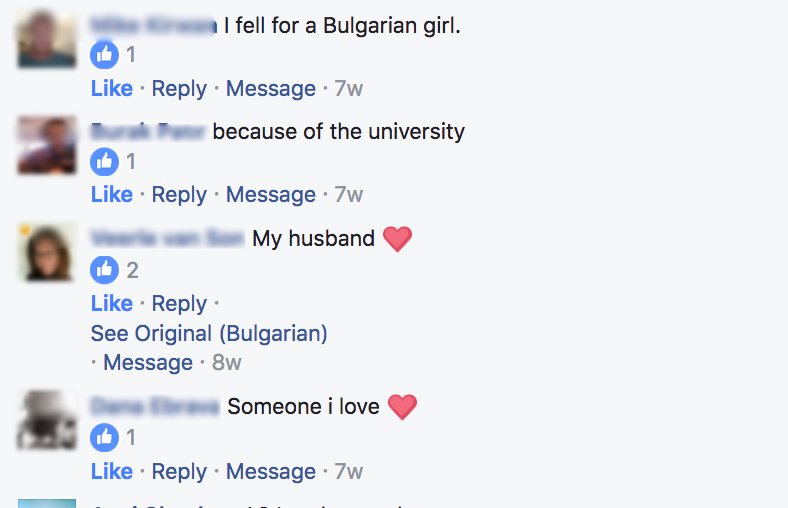 Click here to visit BulgarianPod101. Why textbooks? Textbooks are a safe way to start learning even if they’re a little boring. Unlike silly apps, textbooks explain the language to you. 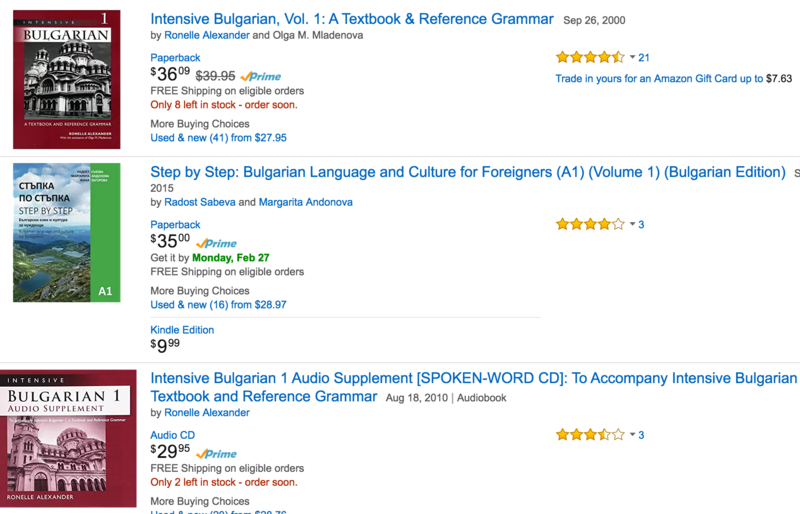 Visit Amazon.com (click here) for Bulgarian textbooks – and choose whichever has the best rating/price for you. Don’t think too much. Any start is good enough. Now what about the Bulgarian language itself? Bulgarian is an Indo-European language with about 9 million speakers world wide. Obviously, most of them are in Bulgaria. The language definitely sounds close to Russian; it’s a slavic language after all. And the alphabet, like Russian, is also Cyrillic. Take a look below to see what the Bulgarian Alphabet, or Cyrillic, is like. Want to learn how to read and write the Alphabet? Check the free PDF lesson available somewhere down below. 3. Is it Hard to Learn Bulgarian? My answer is – learning Bulgarian is as easy as you think it is. Yes, the sounds and the alphabet are different. Yes, it will take time. Yes, you will have trouble remembering some words. But if you approach it from the “yes, I can learn it if I apply enough time and consistency,” you’re good to go. If you think “nah, sounds too hard,” your journey is over right here. Bulgarian is easy for people that know a Slavic language already like Russian. Why? Same letters. Similar sounds. Bulgarian is challenging if you’re an English speaker. Why? Same reason why Japanese are Chinese are challenging – they’re NOT similar to your existing knowledge and language. Nothing to relate to. Don’t let that scare you. Millions of people are learning Japanese and Chinese… out of pure interest and succeeding. Why? Because they’re honestly interested. Because they think they can succeed and so, they do. So, your goal or dream to learn Bulgarian is very, very possible. 4. How Do You Learn Bulgarian? Let’s say you answered with a “yes, I can learn it!” in the part above. What’s next? Do you go get some textbooks? Sure. But, let’s make sure you succeed. Learn 100 Bulgarian Words this month. By March 31st (or whenever). Memorize the Alphabet in 2 weeks. By November 15th. Be able to speak Bulgarian for at least 1 minute this month. By December 31st. Read carefully. All of these are measurable. Either you can speak 1 minute or know 100 words… or you don’t. Plus the goals are small and easy – what’s learning 100 words compared to tens of thousands in the language? Finally, the deadline gives you a date to aim for. Set goals like this and you’ll be OK. This makes learning Bulgarian so much more simpler and achievable. In the world of language learning, Japanese, Chinese, English and Spanish are popular. So why learn it? I can’t convince you to learn a language. If you’re here, you already have the answer. But, I can show you why other people learn Bulgarian. Why learn Bulgarian? Based on the answers below, most learners do it for people: friends and lovers. Lets not leave you hanging. Let’s learn Bulgarian phrases so you can speak a bit. In this lesson, you will learn how to introduce yourself to people using Bulgarian. You’ll also learn how to speak to someone in the Bulgarian countryside and how to greet your elders in Bulgarian. Visit BulgarianPod101.com for more. Let’s move to the next point. Want to learn how to write the Cyrillic Alphabet (that’s used in Bulgarian)? Below is a FREE PDF Lesson – that you should print. Inside, there are worksheets for you to write out each letter several times for practice. Just click on the image to download it and keep it for yourself. So since we’re learning basics – let’s just do the numbers 1 to 10 in Bulgarian. If you want to hear how they sound, play the video below. Play the video (BulgarianPod101 lesson) to hear the numbers. Sometimes, the “path of least resistance” or the easiest way is the BEST way to start anything. It’s like having a gym next door. Because, it’s right there, you can easily go without thinking. If it was 10 minutes away, you’d be less likely to go. Too much resistance! Simply put, every day you get a new Bulgarian word. You spend a minute reviewing it. You listen to the audio, you read the meaning, and you’re done! Tomorrow, you can repeat the process and slowly start adding new learning ways to your routine. Bulgarian Pod offers a free word of the day that you can learn with. Just sign up for their email. Click on the image below to take a look. P.S. I highly recommend this for Bulgarian learners. If you REALLY want to learn Bulgarian with 500+ audio/video lessons by Bulgarian teachers – Sign up for free at BulgarianPod101 (click here) and start learning! Merci! I learned a lot in a few minutes!